To further enhance your aramsa experience, indulge in an healthy meal at the Green Room Café. 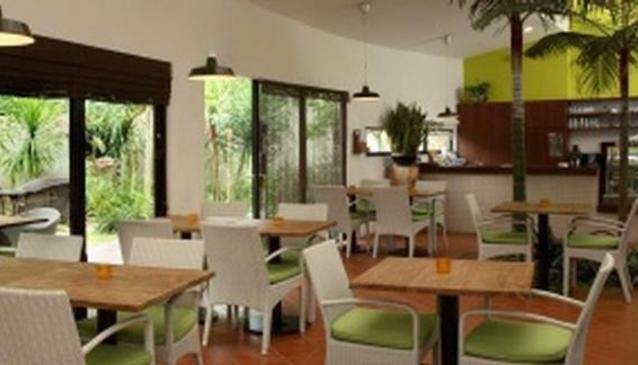 This restaurant offers an exciting, healthy and exciting culinary adventure. Serving Diana von Cranach's 'Rawfully Good' living cuisine with purely Southeast Asian flavours also known as ethno botanical living cuisine. At Green Room Café, all the dishes served on the menu are freshly prepared and offer inspiring, additive-free, plant-based health-giving combinations of fruits vegetables, sprouted pulses, sea vegetables, spices, seeds, leaves, other edible herbs and flowers and using no animal products. The food is balanced to ensure that all the essential enzymes and nutrients are still intact. To further highlight the many different textures and colours, the presentation has careful attention to detail. Most of the ingredients used are locally or regionally sourced, seasonal and free from pesticide and GMO.